Make sure to let your viewers know what’s coming up next with Chapters. This video has a bunch of chapters. Feel free to check them out! Clicking the Chapters icon on the player allows your viewers to see a full index of chapters available to view. Clicking on any of the chapters from the index (or as indicated with the small dots on the play bar) will take them to that point in the video. If you’d like to add Chapters to your Wistia video you’ll first want to navigate to the video in your account. Once there, from the ▸ Video Actions menu, select Customize. This will open the Customize panel. From there you’ll want to select the Chapters option. This will turn chapters on ◉ for your video. Add the chapters you’d like to your video, by clicking the + Add a chapter option. 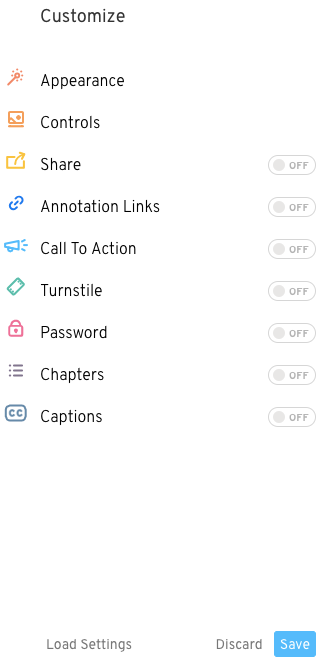 Adjust the timestamp (if you need to), and don’t forget to name your chapters too! The title will appear in the chapter index on the video, as well as appear over the playbar when a viewer hovers over the dot indicator. The max character allowance for chapter titles is 50 characters. You might need to abbreviate your chapter titles, or simply reference the information below the video with text. With the advent of our newest player update, Tiny Vulcan, mobile viewers will see the same Wistia player - with the same features, includng Chapters - as your viewers on desktop computers. What do you need to do to switch this on? Absolutely nothing! It’s automatically enabled in your account, so your viewers can chapter-hop on the go. To remove a chapter from you video you’ll want to navigate to the video within your Wistia account. From the ▸ Video Actions menu, select Customize. Under the Chapters header, you’ll see all of the chapters on your video. If you hover your mouse over a chapter title, an X will appear beside it. To delete that chapter, click the X. Save your settings, then you’re all done! Next up, let’s add some captions!